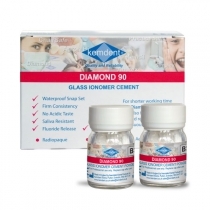 Diamond 90 is a hand-mixed glass ionomer cement for posterior indications, including non-load bearing class I and II restorations, together with class V abrasion cavities. It can also be used for restorations in deciduous teeth, core build-ups, amalgam repairs – where it helps minimise the health risks associated with the removal of old amalgam restorations and the cementation of posts in root canal restorations. Diamond 90 provides dentists with a clinically proven restorative material that effectively performs highly aesthetic restorative procedures, replacing traditional composite, glass ionomer and amalgam methods of working. Chemical curing, without dimensional change means Diamond restorations can be placed in one increment, saving time and avoiding the creation of stresses within the restoration that can be caused by incremental build-up using composites. Both of these advantages also contribute to its relative lack of post-operative sensitivity compared with bonded composites. Fluoride release is another significant advantage. Diamond 90 is also far less susceptible to moisture around the operating site, partly due to its rapid chemical snap-set and its healthier, mercury-free composition. It quite categorically adheres to both enamel and dentine, without the need for acid etching – saving time and additional expense. Finally,it is radiopaque and there is no polymerisation shrinkage and consequent cracking. Shades: Available in 7 shades A2, A3, A3.5, A4, B3, C2 and C4. Working time from start of mix: at 22-24°C 1 minute 30 seconds. Step 3 – clean the cavity with water and gently dry. Remove smear layer by applying Kemdent Diamond 90 liquid for 15 seconds using a cotton pellet. Wash and gently dry. Step 4 – place a vaselined matrix band, if required. Step 5 – shake the bottle of powder to fluff the powder. Dispense the powder and liquid onto either one of the mixing sheets provided, or a glass slab at room temperature in the proportion of one scoop of powder to one drop of liquid. Do not compress the powder. Squeeze the liquid bottle gently to clear the opening, then hold the bottle vertically to avoid air bubbles and dispense one drop. For larger cavities, use multiple quantities of powder and liquid in the same 1:1 ratio. It should take approximately 30-40 seconds to mix them together. Due to Diamond 90’s snap-set and to achieve good adhesion to the enamel and dentine, always mix fresh material for each cavity. After dispensing, the assistant should replace the caps tightly and start to clean the instruments and mixing slab before the material has set. Step 6 – place the mixed material into the cavity and pack into place using conventional packing instruments. Diamond 90 has a firm, putty-like consistency, which makes it easy to pack. Once placed, carve as desired. The working time from start of mixing is approximately 1 minutes and 30 seconds. Diamond 90 has a snap-set after 2 minutes and 10 seconds, which quickly makes the restoration water resistant. Step 7 – six minutes after start of mixing, excess material can be removed using either fine diamond finishing burs or diamond impregnated rubber cups, irrigated and water cooled.